They’re not even finished with college yet, but already Joshua Gaal and Tim Valentine are successfully building up Train 918, the video production, marketing, and branding company they founded as sophomores and will run after graduation. 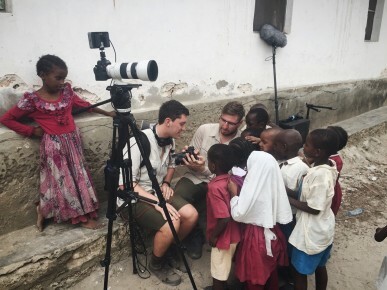 For 10 days in February, the Butler seniors were in Kenya, making promotional videos for a company called Roots Coconut Oil. 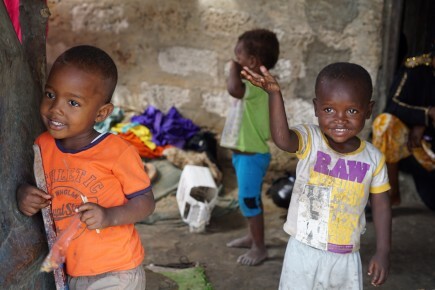 Their job: show the process of harvesting coconut oil and explain Roots’ focus on providing good wages, clean water initiatives, and more for the Kenyan people. The results will be posted on rootscoconutoil.com this summer. 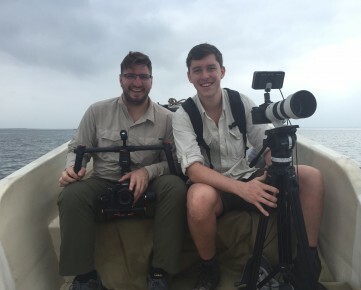 “Being able to go to Kenya and not be in class for seven days—I’m sure it doesn’t make the professors happy, but they were very understanding,” said Valentine, a Digital Media Production major and Marketing minor from Cincinnati, Ohio. Gaal and Valentine said the experience was extraordinary. They shot footage on the island of Pate, about 300 miles from the capital city of Nairobi. They didn’t have a lot of downtime, but they managed to see giraffes, a pack of lions, and lush scenery. Gaal, an Art + Design major and Digital Media Production minor from Whiting, Indiana, said one of the challenges he enjoyed was meeting the children on the island and gaining their trust. Valentine and Gaal got the job with Roots through a Butler connection—senior Riley Supple, an intern with the coconut oil company, recommended them. 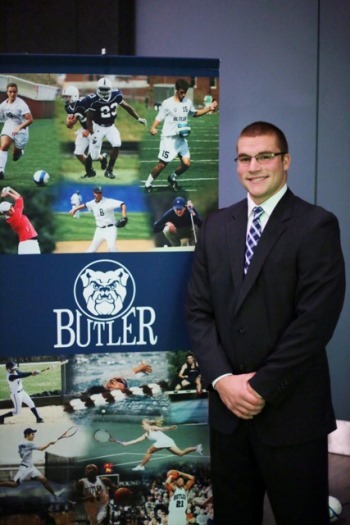 He had good reason to: Junior year, Valentine and Gaal worked on an admission video for Butler Marketing that has served as a calling card to attract future business. The positive reaction to that effort led them to create Train 918, which they named for a train car they rode in as sophomores during a College of Communication trip to Germany. They followed the admission video this semester with a video for the Butler University Police Department showing the best practices to follow if there’s an active shooter on campus. Mark Pearson ’16 took the elevator ride most aspiring sports journalists dream of—to the press box at Lucas Oil Stadium to cover Monday Night Football. Post-game, he attended a press conference with Colts coach Chuck Pagano and quarterback Andrew Luck. He was even granted access to the Colts locker room where he interviewed Trent Richardson, Dwayne Allen and several other Colts players. Pearson had the opportunity to cover the Colts game through his Sports Media major ­– the newest addition to the College of Communication curriculum. Sports Media Coordinator Eric Esterline said the degree offers students academic and experiential learning in journalism and production with a special focus on the sports industry. The major just opened to students this fall, but Esterline said the program has already garnered a lot of interest. He said about 10 Butler students transferred into the major from other fields, and nine freshmen matriculated directly into the program. Pearson shifted to the Sports Media major from the Journalism program. He said it was an easy decision to make. Esterline said sports media students enrolled in the BU:30 course, JR407, are assigned two sports beats to cover each semester, one in Butler sports and one in professional sports. He worked this summer to arrange student opportunities with local sports teams like the Pacers, the Colts, the Indians, Indy Eleven soccer and Indy Fuel hockey. Esterline said the program has an advantage in the experiential opportunities it can provide students. Pearson said it was an amazing opportunity to cover Monday’s Colts game as a Butler student reporter. While the Colts may have lost, Pearson definitely didn’t. He commuted to Butler in his Model T Ford, walked around campus when the only buildings were Jordan Hall, Butler Fieldhouse, the Phi Delta Theta house, and the Campus Club, and played on the Butler baseball team with Oral Hildebrand, who pitched in the major leagues from 1931-1940. 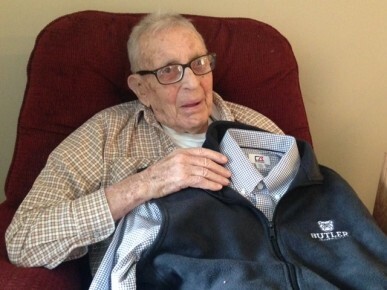 He’s Sam Arnett ’33, believed to be Butler’s oldest living graduate. And on February 25 he turns 105. Back in the day, he grew up in Indianapolis and went to Tech High School with thoughts of being in pharmacy like his father. 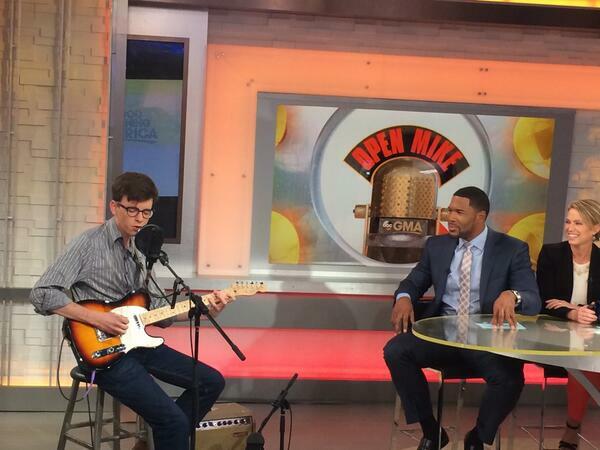 “‘You’ll work a lot of hours, you’ll make poor money,’” he recalls his father saying. So he came to Butler, where he majored in Business Administration. Butler “was a very enjoyable place to go to school,” he said. He remembers Tony Hinkle as a nice man (“I never heard a word against him”) and describes his time at Butler like this: “We attended our classes, we made our grades and played baseball.” He was a “good enough” outfielder. After graduation, Arnett went on to Purdue University for a second bachelor’s degree and a master’s, then went to work for Eli Lilly and Co., retiring after 41 years. He moved to Florida for 20 years, then returned to Indiana to be closer to his family. These days, Arnett lives in at Wellbrooke of Westfield, an assisted-living facility, where he keeps a Butler pennant on his wall and copies of The Drift, Butler’s yearbook, and clips from The Butler Collegian nearby.